Who doesn't love freshly popped popcorn? 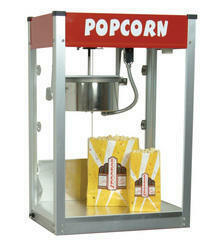 Busy Bee offers an easy-to-use machine, that makes some of the best tasting popcorn! Turn the machine on and let it warm up, cut open the packet of salted kernels and oil, add it to the kettle, and watch the magic happen! You will have all your guests coming back for more! And the best part is, when you're done with the machine we pick it up and clean it at our warehouse, no hassle for you!